i have always wanted to buy my son plaid pants! they are the coolest little man pants i have ever seen. in fact, i like them so much, he wore them 3 (yes 3) days in a row. not the whole day though, i'm not that obsessed.... just whenever we went out.... which of course we did alot of, cause i wanted people to say how cute he was. and they did. and i was happy. 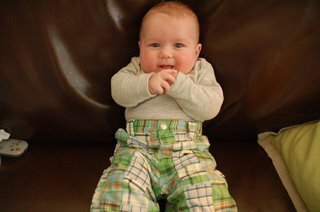 and since these are green plaid pants i think he needs a pair of blue plaid pants. but then i really think about it... and it's becoming summer time... so... he needs a pair of plaid SHORTS!!! i love plaid.